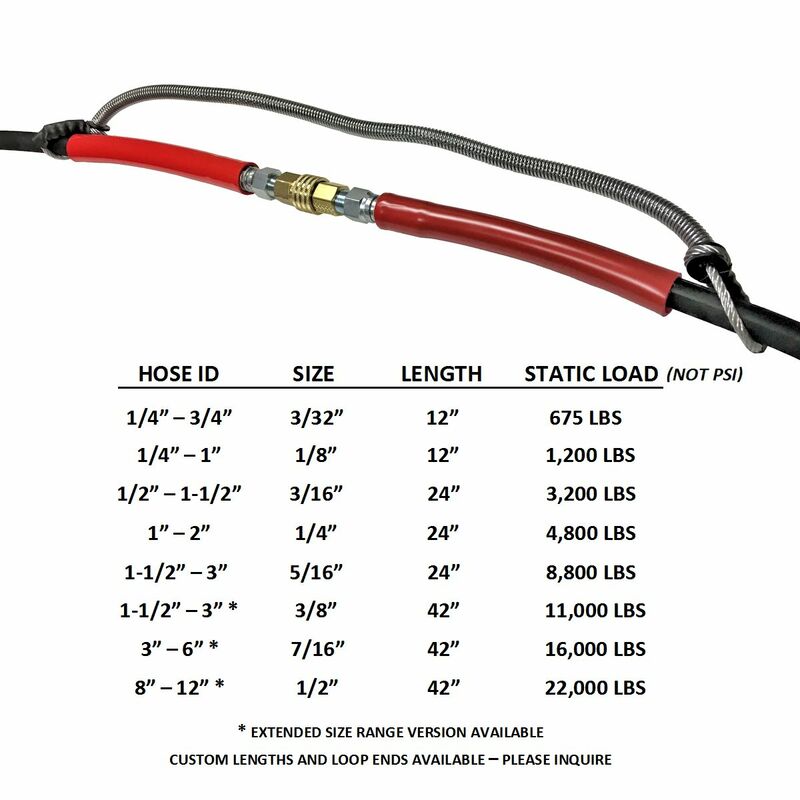 Hose safety cable chokers significantly reduce the hazards of an unchecked pressurized hose during a connection failure. Cable chokers are designed for hose applications where a pressure rating beyond the hose whip checks is required. These safety restraints can withstand several thousand pounds of pressure (dependent on cable and hose diameter) and are tagged with their fluid and gas (air) ratings. The unique design includes a nylon spool at each loop-end that allows the cable choker to cinch tighter around an unchecked hose. 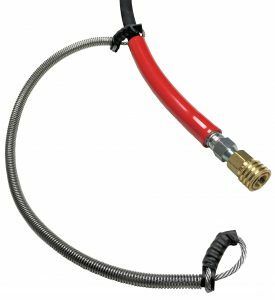 This not only holds the hose in place, but can also significantly decrease or stop flow completely until the pressure can be relieved at its source. Hose safety cable chokers range from 3/32 cable up to 1/2 inch cable, for a hose (inside diameter) range from 1/4 inch through 8 inch. Custom cables can be fabricated to your specific application for increased pressure rating, abrasion resistance, or the connection of varying sizes of hose. Models are now available for frac hose and other high pressure lay-flat discharge hose through 12 inch diameter. This product must be specifically matched to the hose and application in order to function properly. Only with complete application information it is possible to quote a hose choker cable that will perform as needed in the event of a hazardous hose failure. The following are a list of known North American regulations regarding hose safety restraints and whip check devices. Please check directly with all regulating agencies pertaining to your job site or workplace to verify the most up to date hose safety rules and regulations. OSHA29 CFR 1926.603 paragraph (a)(10): Safety chains, or equivalent means, shall be provided for each hose connection to prevent the line from thrashing around in case the coupling becomes disconnected. OSHA 29 CFR 1926.302(b) (1): Pneumatic power tools shall be secured to the hose or whip by some positive means to prevent the tool from becoming accidentally disconnected. US Army Corps of Engineers 13.G.02: Connections and nozzles shall be designed to prevent accidental disengagement. All connections shall be equipped with safety lashings. 20.A.17 Connections with high pressure hoses must be secured with a safety lashing/whip check. Canadian Centre for Occupational Health & Safety: Make sure that hose connections fit properly and are equipped with a mechanical means of securing the connection (e.g., chain, wire, or positive locking device). MSHA 30 CFR §56/57.13021 High-pressure hose connections: Except where automatic shutoff valves are used, safety chains or other suitable locking devices shall be used at connections to machines of high-pressure hose lines of ¾-inch inside diameter or larger, and between high-pressure hose lines of ¾-inch inside diameter or larger, where a connection failure would create a hazard. MSHA 30 CFR §75.1730 Compressed air; general; compressed air systems (e): Safety chains, suitable locking devices, or automatic cut-off valves shall be used at connections to machines of high-pressure hose lines of three-fourths of an inch inside diameter or larger, and between high-pressure hose lines of three-fourths of an inch inside diameter or larger, where a connection failure would create a hazard. For purposes of this paragraph, high-pressure means pressure of 100 psi or more. WARNING: Cancer and reproductive harm. Visit www.P65warnings.ca.gov for additional information.